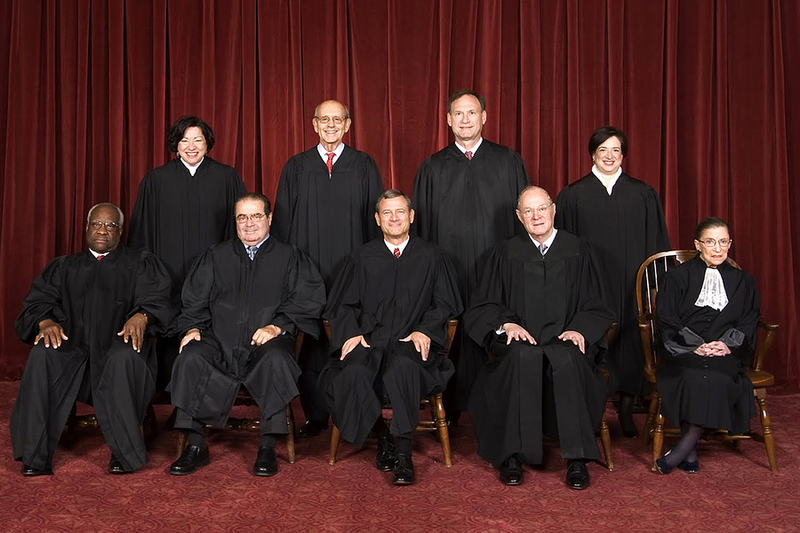 The US Supreme Court has announced they are irrelevant. Following the US Supreme Court’s 5-4 decision that legalized gay marriage across the nation, a firestorm erupted among conservative media and Republican politicians. Some see it as an attack on religious liberty, some see it as big government sticking their nose where it doesn’t belong. Perhaps the most interesting comments came from the dissenting opinions of the Supreme Court Justices that were on the losing side of the ruling, mainly Chief Justice John G. Roberts and Justice Antonin Scalia. During the arguments they bickered back and forth on what is or is not Constitutional. During the hearing it became clear that Scalia did not even know the law surrounding the case. The conservative Justices gave no compelling argument, outside of the religious realm, that could hold up. They gave no facts or logic that could not be completely disputed or disregarded. Thus, in the end, equality won out and people’s rights were restored. That didn’t stop Scalia from making statements that have us questioning the relevance of the Supreme Court. Scalia, in his dissent, said “A system of government that makes the People subordinate to a committee of nine unelected lawyers does not deserve to be called a democracy.” Basically, he is saying that his job should not exist, that if we are to be a democracy, we can’t have nine unelected officials decide what is right for the entire nation. And that is actually something on which I can wholeheartedly agree with him. I have argued that same point myself, time and again. His statement is not what I have an issue with here, it is the timing of it. Scalia never has an issue with nine unelected officials making decisions when he falls in the majority. He only whines like this when the rulings do not go his way. Imagine how much different we would be as a nation if he used that same logic in the Citizens United ruling. Imagine where we might be if he had that same opinion after the 2000 election was handed to George W. Bush by the Supreme Court, a move that many people today claim was unconstitutional and completely undemocratic. Unfortunately, he only cares about democracy when it disagrees with his world view. Scalia is from the old world. He has already proven, many times, that not only is he out of touch with society, that he doesn’t even understand our laws as they are written or applied. This is a major problem for somebody who has so much power to shape and alter the direction our nation will take. Now that we have identified the problem we need a solution. I’ve heard many call for Supreme Court Justices to be elected officials, voted in by the people. The issue I have with this is that it will lead to pandering for votes. It will create the same partisan misinformation that you get from other elections. And special interest and lobbying groups could then basically buy Justices the same way they currently attempt to buy elections (Thanks to the aforementioned Citizens United ruling). That will not work. My solution is simple, you have most likely heard it before. We implement term limits on all unelected officials. The amount of time one can serve can be debated, whether four years, eight years, a decade. But it should not be a lifetime commitment. This will allow different perspectives into a position that has so much power. This would hopefully ensure that we will not be stuck with somebody like Scalia, who does not understand the law and is stuck in time somewhere in the middle of last century, for long enough for him to do serious damage. Another way to weed out those who do not know or understand the law is to hold them more accountable, something that is not done at all today with our Supreme Court Justices. If any Justice demonstrates they do not understand the law or the Constitution, they can be voted out by our elected officials and replaced using the same process we always have, Presidential appointment and Congressional approval. These solutions may not fix everything that is wrong with the Supreme Court, and it may not completely fix our democratic process, but it would be a step in the right direction. This change would help to make sure our Justices are in touch with our current society, with We The People. It would hold our unelected officials accountable and it would provide us with some level of control over the Courts, who have far too much power to begin with. This entry was posted in Opinion and tagged 2000 election, accountability, Al Gore, Anthony Kennedy, Antonin Scalia, Chief Justice John G. Roberts, Citizens United, Clarence Thomas, democracy, Elena Kagan, gay marriage, George W. Bush, politics, Ruth Bader Ginsburg, Samuel A. Alito, SCOTUS, Sonia Sotomayor, Stephen G. Breyer, term limits, US Supreme Court. Bookmark the permalink.